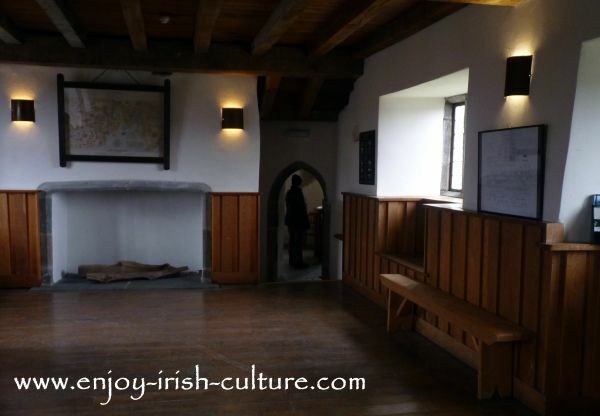 One of the most beautiful castles of Ireland, Parke’s Castle has been lovingly reconstructed by its' guardians, the Office of Public Works, using traditional materials and traditional craftsmanship. This page will discuss the castle's features. Join us on a tour of Parke's Castle here! The 17th century Parke's castle presents a transition between fortified medieval castle and manor house. Captain Parke must have had fears for his safety as he held on to most medieval defensive features, yet the front of the castle is a manor house featuring larger windows which became more commonplace in the 17th century. Parke's Castle is open to visitors between April and September. 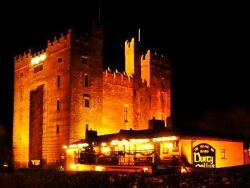 The castle is located 25 minutes from Sligo town just over the border to County Leitrim. 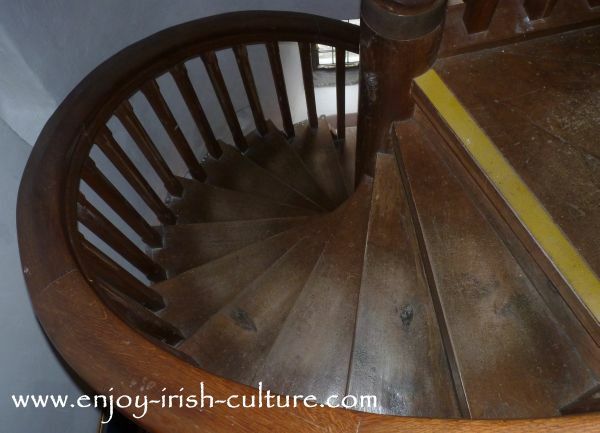 The Defended Stairway- When reconstructing the stair way of the castle the master carpenter who was carrying out the work discovered from the positioning of alcoves in the wall that the stair case was moving downwards in a clockwise motion. This means that captain Parke was more than likely left-handed as medieval castle stair ways were designed to be easily defended by sword. See the stairway below. The banqueting hall seen below was the place for feasts, dining, entertainment and for welcoming guests. The battlements sen below are part of the defenses of a castle providing a place to stand guard with good views while also being protected from incoming arrows or, later, musket balls. What good would a medieval castle or tower house be without its own forge? A forge was crucial for making and sharpening tools such as pickaxes, and for shoeing horses. 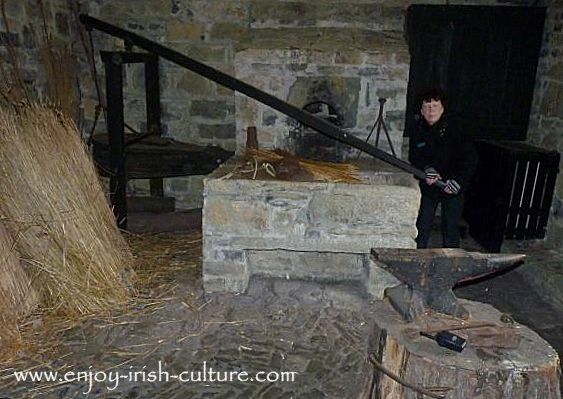 At Parke’s Castle the forge was a thatched stone building, and it is now beautifully reconstructed. In the photo above the guide at the castle demonstrates how the bellows were used at the forge. 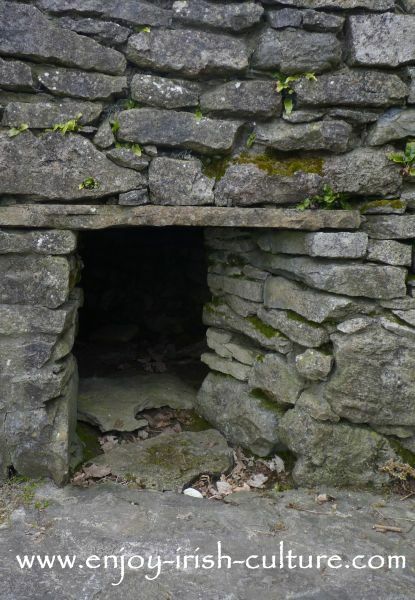 One the grounds of Parke’s Castle you will find a 12th century sweat house, the medieval equivalent of modern day spas. It would have been used by Sir O’Rourke and his entourage! The sweat house is basically a man made cave or souterrain, large enough to fit a small group of people, however it was probably men only I’d imagine. Where did the heat come from? They heated rocks in a fire and then moved them into the cave. When everyone was inside they would seal the entrance. To cool down after the sweat they jumped in the lake, only a few feet away. Dare enter the sweat house at Parke's Castle? A moat is part of the defense structure of a medieval castle, providing an area that, for attackers, is difficult to cross. Normally you would think of a moat as filled with water...but Parke’s castle shows us otherwise. The moate at Parke’s Castle had the waste from the stables (and probably human waste, too) emptied into it through openings in the wall making it a rather smelly part of the defense system! However, in medieval times, the water level in the lake was much higher than it is now and would have washed away at least some of the feces. The moat at Bunratty Castle, by the way, was the same! Parke’s Castle has a pigeon tower. The medieval Castles of Ireland by law had to keep messenger pigeons so as to be able to communicate quickly. How did it work? Well, you had to collect pigeons from all the other castles you wanted to communicate with and keep them in your pigeon tower. When you wanted to send a message to a particular castle, you had to find their pigeon in your pigeon house, attached the written message to it and set it free. The pigeon would make its way back to where it was raised. Another reason for keeping pigeons was that pigeon poo was used in the manufacture of...believe it or not gunpowder! You can see how a pigeon tower was a very important feature in a medieval castle indeed. 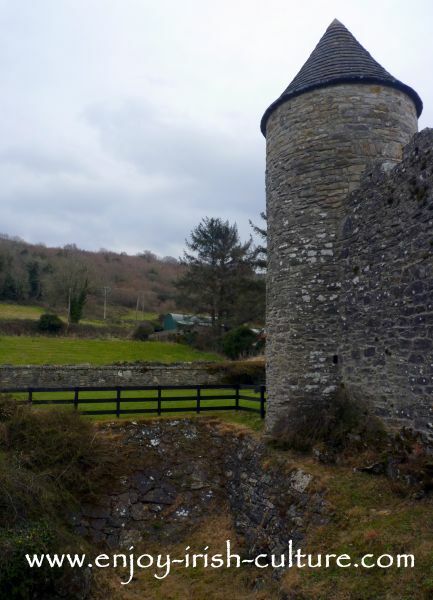 The medieval castles of Ireland needed their own independent water supply! Clean water was needed as drinking water for both animals and humans, as well as for washing and for laundry. 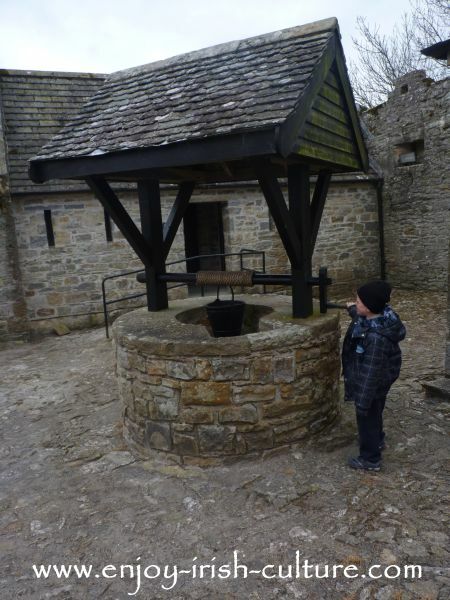 This reconstructed well is particularly nice. It demonstrates how people took care of their water supply- the high wall around the well, and the roof over it protect the water from contamination. 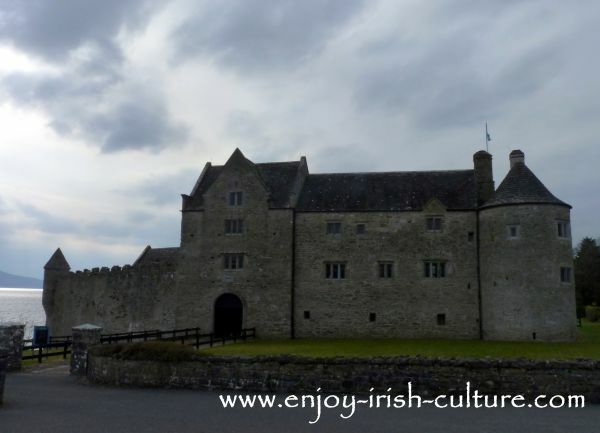 Find out visitor information for Parke's Castle here including our opinion and special tips. Find out about the history of the castle here. 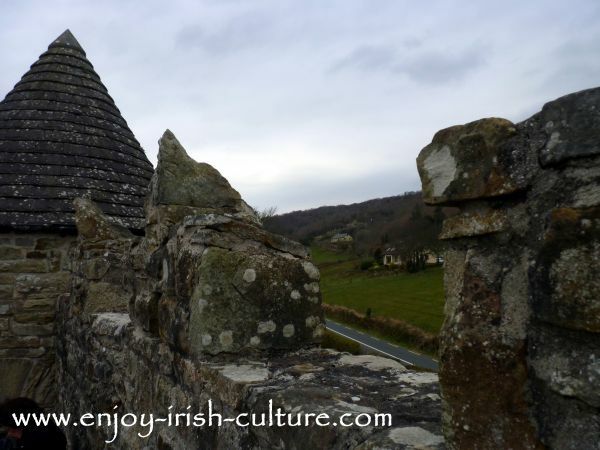 We hope you enjoyed this article on one of the best visits to any of the castles of Ireland. For us, creating this website is a labour of love. Please let the whole world know this website exists, so that others can enjoy it, too. Doing this will only take a few seconds of your time. You can use any of the social functions we provide on this website- both at the top left, and at the bottom of the page. We appreciate your support. Many thanks, Regards, Susanna and Colm.